In last year’s acclaimed Marvel movie the Border Tribe of Wakanda serves as homeland security for protecting their country from interlopers and invading forces. 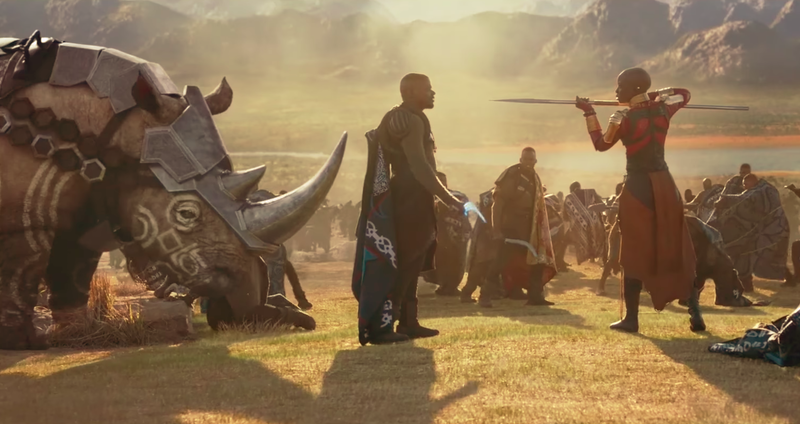 In addition to being charged with disguising the nation’s borders as a rural countryside, the tribe also manages part of Wakanda’s military might with its blue-caped garrison and a cavalry of white rhino. 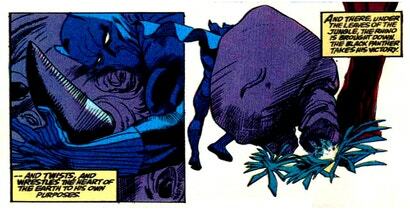 In Black Panther, white rhino are shown to be friendly enough to be hand fed by the tribe’s head of security, W’Kabi. They were also seen to be capable of recognising the social hierarchies established between humans, such as when W’Kabi’s vibranium clad rhino yielded to Wakandan Dora Milaje Okoye during the events of Black Panther. The advent of animal domestication happened during the agricultural revolution in approximately 10,000 BC in Central Asia and innovated the use of animals to cultivate land and serve the needs of humans. The use of a plough was driven by the domestication of animals capable of manual labour. Animals such as goats, sheep, and chicken that could also serve as a source of nutrition (milk and meat) or textiles (leather) were valued the most. These could have been motivations to domesticate an animal like the White Rhino, but it doesn’t seem like the animal would have been good for it. Rhino milk is not very rich in fats or protein, for example.Surprisingly, rhino may be good plough animals as demonstrated by a single white rhino in a safari park in Georgia (Thank you, YouTube). Domesticating rhinos would require a lot of work. The White Rhinoceros is the second largest mammal on land weighing in at more than 4,000 poundsand standing as tall as 1.83m and can run around 50 to 60 kilometres per hour. In order for this Rhino to become domesticated we would have to assume that Wakanda and a pocket population of White Rhino shared a common ecosystem. Within this shared space, Wakandans would have to have spent hundreds of years taming individual Rhino. Taming rhino would involve behavioural conditioning to decrease the natural avoidance a rhino may have toward humans. Through taming, members of Wakanda’s tribes would identify docile individuals to selectively breed and generate a unique lineage of animals that, over generations, would become genetically different from their wild ancestors. These individuals would become the subjects of domestication and begin to be born with the behavioural traits that previously required taming. As seen with other domesticated animals, Wakandan White Rhinos would become more docile, and transition away from seasonal breeding into a more regular estrus cycle. Following changes to their behaviour, there would be additional desensitization to stress hormones, altered neurophysiology, and changes to brain development. This would result in reduced function of the limbic system and its control over aggression and its reaction to environmental stresses. In fact, we even have an idea which cells may underlie domestication syndrome. 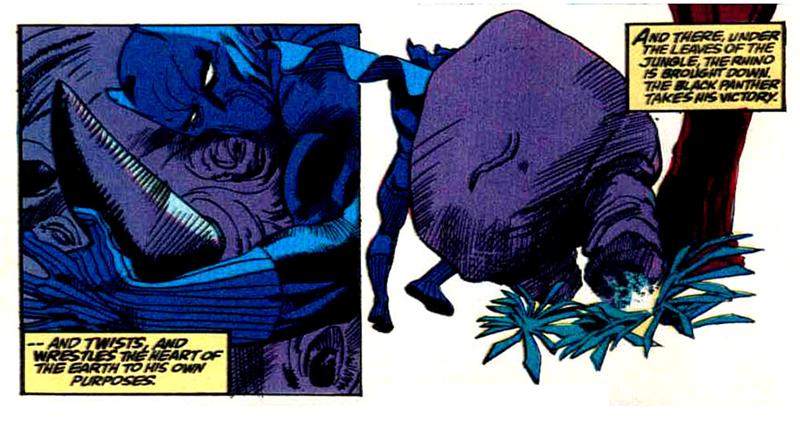 During the initial taming of Rhino, Wakandans would have to place themselves in an influential position in the complex social system of the rhino. This is thought to be one of the ways in which wolves could have been domesticated by humans to become dogs. Humans could assert dominance over these animals by deciding when they could eat and establish boundaries on their territories and behaviours. Thankfully, the white rhino is already considered the most sociable species compared to black rhino and other Asian species, which are particularly aggressive and solitary. Some of the needed steps to domestication would be upsetting to people who love animals. One way to position a human into their social system would be to separate a mother from her recently born calves and have them imprint onto human caretakers, believing them to be their mother. This bond would allow some control over their confinement and when they could be released to graze. As these calves reach adulthood, males are likelier to become aggressive and could be castrated to curb their aggression and testosterone. This is how stallions are made into geldings in order to accommodate their behaviours in stables. Gelding (or castration), I would assume would be among the duties of Wakanda’s standing Black Panther since I don’t think many other people could survive getting between a mother and its calf or a bull and its testicles. Save for one talented White Rhino in Georgia, we have not been able to domesticate Rhinos as we have domesticated other animals for agriculture. As for using them for war, the idea of an armoured rhino being ridden into battle has an odd history. In 1515, a wood print of an Indian rhino was introduced to Europeans by the painter and printmaker, Albrecht Dürer. This depiction became incredibly popular and was made into a woodcut that replicated this picture for three centuries. There was one problem. Dürer had never seen a rhino in his life and based the woodcut print off of a written description of what a rhino looked like and a sketch from an unknown artist. 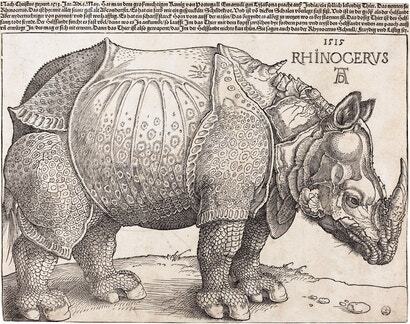 As you would imagine, this let Dürer’s imagination add features that simply do not exist on the anatomy of a rhino. Dürer’s rhino had riveted armour plates all over its body an extra horn on its back what looked like a breastplate. This misrepresentation may have misinformed the perception of these creatures to Europeans, possibly leading them to believe that these animals can be used for war or serve as mounts. Aside from the skewed perceptions of Europeans 500 years ago, there are likely to be several other variables that would make domesticating rhinos difficult and possibly dangerous. For starters, their reproductive cycle is very long. Rhino females are capable of getting pregnant every 2-5 years for 16-18 months at a time and giving birth to only one calf. This calf then has to wait for 6 years before it becomes a reasonable size. Compare this to a heifer that takes 1-2 years to sexual maturity and its 9 months of pregnancy (and gives you milk and meat!). This is a very large commitment for very few gains. As for using them as mounts, they startle easily and have a sharp horn that would present a hazard for anyone who thinks they can saddle up. Worst of all most rhino have incredibly terrible eyesight and are only able to distinguish objects less than 4.57m away. To be fair though, they make up for it with an incredible sense of smell and hearing but this is an evolved trait that keeps them alert of their otherwise quiet surroundings. 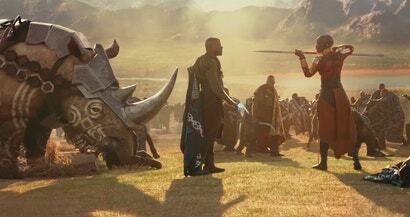 At best, on the battlefield depicted in Black Panther, a rhino may charge through an army, just run away from the danger. One other problem: they might wreck the country. Rhino would need a very large amount of land to graze off of which would make it difficult to raise them in captivity or shepherd across a savannah. Rhinos are actually considered keystone species, meaning their role is important enough to shape the ecology of their ecosystem. In a normal environment, a rhino’s grazing diversifies plant life, culturing a land that can support various other animals. In order to domesticate the animals and increase their numbers on the savannah, they would wreak ecological havoc on Wakanda’s lands. Overgrazing by rhinos would destroy plant life over many acres, leading to erosion and desertification. Sebastian is an Assistant Professor at Queens College CUNY that studies how genes interact with the environment and is the co-founder of Thwacke Consulting@Sebcredible. They were also seen to be capable of recognising the social hierarchies established between humans, such as when W’Kabi’s vibranium clad rhino yielded to Wakandan Dora Milaje Okoye during the events of Black Panther. Disagree with the take here. I took that as more that Okoye had raised it and was basically treated as a mother or similar so it refused to hurt her. It was who she was, rather than what she was. That was my takeaway as well. It recognised a friend/trainer, rather than someone of authority. Given their intense sense of smell, it seems all the more likely to me now. Having said that, if they were trainable, as they were presented to be, you should be able to train them to recognise the uniform. Wasn't how I saw it though. That's basically what they mean by social hierarchy though admittedly it's too broad a term and more often associated with class division. Our success in domesticating dogs came from our ability to take the place as the pack leaders. We often don't associate our positions as pet owners as something of a power position but that's exactly what it is. I've been training dogs for a long time and the base of that is asserting my dominance and maintaining it, even though it's done with love and affection.